This pin was released as part of the Mickey's Very Merry Christmas Party 2016. It features Mickey Mouse sitting by the MVMCP logo on green glitter wearing a Santa Hat, green scarf and holding a candy cane. Different snowflake designs surround the pin in silver. Mickey mouse is in a fancy silver frame with a yellow background. A small, silver hidden Mickey is to the right of Mickey's face. At the bottom of the frame there is a small banner that says "Mickey Mouse". This open edition pin released at Walt Disney World and Disneyland features Mickey Mouse in a tuxedo (tie and tails) with red pants, black jacket, a yellow bow tie, and white spats on top of black shoes. His hands are spread out wide. Our pins all feature the rubber Mickey Shaped backing. This pin features a Mickey Mouse cupcake. The cupcake has a red wrapper with yellow ovals on it that are similar to mickey pants. The icing is a yellow color. This pin was released at the start of the year by the Disney Travel Company as part of the Celebrate Everyday Disneyland 2009 Promotion. This pin depicts the up to date Mickey and Minnie Mouse as they appear to be ready for a Birthday Party, there are two Mickey shaped Balloons with streamers in the background. The balloon behind Minnie is red, and the balloon behind Mickey is purple. Mickey and Minnie are wearing party hats. Mickey's is red with yellow stars, and Minnie's is pink with a bow attached to the front. There is a blue banner at the bottom of the pin below Mickey and Minnie's feet, which says "Disneyland(c) Resort" in silver letters. Mini-Pin Collection - Cute Characters - Faces of Mickey Mouse and Friends (Version #2) - Mickey Mouse. Mickey and Goofy stop to pose for a picture together. Goofy has his green hat raised in greeting; Mickey's right hand is stretched out beside him, his left arm around Goofy. 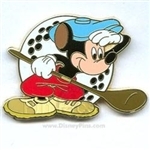 Mickey Mouse is keeping an eye on his drive in this Open Edition pin. He is standing in front of a large golf ball, facing right, wearing red pants, a blue hat and carrying a golf club. This pin was inspired by Walt Disney's Canine Caddy animated short that debuted in 1941. Celebrate the 10th anniversary of Disney Pin Trading with this open edition pin booster collection featuring the Disney characters. The Mickey pin has Mickey's head at the top of a number 10, with the banner "Years of Pin Trading" at the bottom. Mickey Mouse, in his Fantasia role from "The Sorcerer's Apprentice," is shown in the upper right corner; he holds a gold wand in his right hand and his left hand reaches downward. He is shown from the chest up. To his left is the number 25 in gray; at the bottom, in gold-outlined red, is "Walt Disney World." It was sold during the WDW 25th anniversary celebration. Oh Mickey! is a new series of merchandise featuring classic, pie-eyed Mickey Mouse. This open edition mystery collection features different faces of Mickey Mouse within various colored frames. Mickey Mouse is taking a ride on a cork while in front of a large green leaf. He is dressed in orange, brown shoes and a yellow hat with a red feather. This pin was inspired by Walt Disney's Mickey and the Beanstalk segment of the 1947 feature film Fun & Fancy Free. A classic pie-eye Mickey has his arms wide open on this pin with the year 2001 under him - one leg is lifted up. The words Mickey Mouse are on either side of him and a double MM is on the globe behind him. Mickey is 3D (pin on pin). Pin features Mickey Mouse in a nerdy outfit including a tie and blue glasses. He also has a pencil tucked in front of his ear. A classic, pie-eye Mickey Mouse and Pluto smiling on this pin. Pin reads "Participant 2008" in yellow lettering. This is Mickey Mouse from the WDW Character Pop Art Style mini-pin boxed set (#70033). This listing is for the Mickey pin from the open edition "Nerds Rock!" Head Collection (#90174). This is the Pluto (holding a bag of bones) at World of Disney Store pin only from set #78643. The world famous Disney characters enjoy the attractions of Walt Disney World Resort in this deluxe starter set. This set contains a lanyard with special lanyard card and eight pins featuring various Disney attractions. This is a pin with a red background. It features Mickey Mouse's hand with white glove doing a thumb's up. This is #3 from the Disney Store 2000 Millennium Series. It has a light brown background with filmstrips at the top and bottom. Mickey Mouse is holding a pail and fishing pole. 1953 is printed at the top right side of the picture. This is pin number 7 from the Disney Store Countdown to the Millennium series: Two Gun Mickey. This is pin number 97 from the Disney Store Countdown to the Millennium series: Fun and Fancy Free. The pin shows Mickey in the "Mickey and the Beanstalk" sequence. The bottom of the pin reads "September 27, 1947". Part of the 2002 12 Months of Magic series available at Disney Stores. Mickey holding January 2002 scrolled calendar with days of the month in calendar form. January is printed across bottom. This listing is for the Chuckling (Orange) pin from the open edition Mickey Expression mystery collection (#90963). This pin features an orange colored Mickey Mouse silhouette in a black square with Mickey's name at the bottom. Mickey has a chuckling expression. Mickey Mouse sitting at a computer with the words "Disney Pin Trading" on the screen. Released at MGM in May 2001. This Hidden Mickey Pin features a Blue Pin Trading Logo, with "Disney PIN TRADING" on the top and "AROUND THE WORLD" across the bottom. There is a lavender/purple banner behind Mickey Mouse. This patriotic red, white & blue circular pin shows Mickey Mouse in an Uncle Sam hat. President's Day is written across the top and 2002 is in the center just under Mickey's face. The Mickey is 3D and the blue edging is almost translucent. At the bottom there appears to be two American flags. This Open Edition pin-on-pin features Mickey Mouse and Donald Duck enjoying an exciting ride on the Kali River Rapids attraction. Mickey Mouse is featured "Where everyone screams at the sight of a mouse" in this Open Edition pin. This listing is for the Steamboat Willie pin from the open edition Character Hats mystery collection (#89365). This listing is for the Hmph! (Green) pin from the open edition Mickey Expression mystery collection (#90963). This pin features a green colored Mickey Mouse silhouette in a black square with Mickey's name at the bottom. Mickey has a Hmph! expression, with his eyes and mouth closed. This listing is for the Upset (Teal) pin from the open edition Mickey Expression mystery collection (#90963). This listing is for the Baffled (Pink) pin from the open edition Mickey Expression mystery collection (#90963). This listing is for the Winking (Neon Yellow) pin from the open edition Mickey Expression mystery collection (#90963). This pin features a neon yellow colored Mickey Mouse silhouette in a black square with Mickey's name at the bottom. Mickey has a winking expression. This listing is for the Laughing (Purple) pin from the open edition Mickey Expression mystery collection (#90963). This listing is for the Scared (Red) pin from the open edition Mickey Expression mystery collection (#90963). This listing is for the Angry (Blue) pin from the open edition Mickey Expression mystery collection (#90963). This pin features a blue colored Mickey Mouse silhouette in a black square with Mickey's name at the bottom. Mickey has an angry expression. This listing is for the Smiling (Pink) pin from the open edition Mickey Expression mystery collection (#90963). This listing is for the Happy (Yellow) pin from the open edition Mickey Expression mystery collection (#90963). This is a larger round pin. It shows Mickey and Minnie Mouse in Jungle Gear, standing in front of a vine-covered tree. There is a monkey and a parrot sitting on the branches of the tree. The words "Disney Wildlife Conservation Fund Walt Disney World" on the front of the pin. The back of the card states that, "Forty percent of the retail purchase price of this pin will benefit animals by supporting research and habitat protection around the world". This gold-finished, textured-back pin has a diameter of 1 5/8". Remember the wildest ride in the wilderness with this Open Edition pin. Featuring a slider, this pin celebrates Big Thunder Mountain Railroad located in Frontierland® at the Magic Kingdom® Park. Mickey Mouse, Goofy and Donald Duck are hanging on as they go for a ride. It consists of the train in brown red and green with the characters all riding around the bend on the ride. The train slides back and forth on the track. The pin reads "Thunder Mountain Railroad"
This listing is for the Sorcerer Mickey pin from the open edition Mickey Mouse Icon mystery collection (#86540). This open edition mystery collection features various Disney Character on the Mickey Mouse icon. This pin is black and features the Sorcerer Hat and red robe with brown belt tie. Wishes once thought impossible may just come true at Walt Disney World® Resort and Disneyland® Resort. Over a million dreams will be randomly awarded by Disney Cast Members during the The Year of a Million Dreams celebration. A Silver Lanyard was created especially for Walt Disney World® Resort. The lanyard contain two pins - one is this one with Mickey Mouse and Minnie Mouse. The characters are dressed in new Where Dreams Come True attire. This item will not be sold in stores and will only be awarded at random to Guests. This is a 100 Years of Magic Pin with Mickey painting the 100. It is said that they were given out as gifts at conventions and media events promoting the year's celebration. It was also given out when certain Guest ticket purchases were made. This pin is only available to those who book a vacation thru the Disney Travel Company at WDW. It features the 100 Years logo - Mickey Mouse is painting a red 100 with a white banner going around his legs that reads YEARS OF MAGIC. It has a gold background and is outlined in gold. Similar to Pin Trading Pin (PTP), This pin adds the name Epcot. It features Mickey with the official pin trading logo in front of Spaceship Earth. A classic, pie-eye Mickey Mouse smiling on this pin. Pin reads "Participant 2007" in yellow lettering. This listing is for the Mickey Mouse pin from the open edition Mickey Mouse Icon mystery collection (#86540). This open edition mystery collection features various Disney Character on the Mickey Mouse icon. This pin is black and features Mickey's red shorts with white buttons. This listing is for the Mickey Mouse pin from the open edition Disney Characters as Cars Set (#94915). Modern Mickey of today looking cool, wearing white pants, blue Varsity sweater/jacket with red lapels or vest, and red and white shoes/sneakers with his hands on his hips. Mickey is looking all American! This pin is one of a set of 16. These pins can only be bought in sets of 5 which are randomly selected. This pin is of Mickey Mouse as an artist. He is standing with his back towards us while holding a brush in his right hand and an artist palette in his left hand. This pin is one of a series of 16. These pins can only be bought in sets of 5 which are randomly selected. This Open Edition pin features an adorable Mickey Mouse with an oversized head which is attached with a spring. This pin is part of the new Cuties Collection. 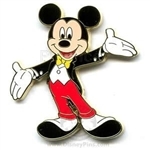 In this pin, Mickey is wearing his traditional red shorts, white gloves, and yellow shoes, and he has a white face. This listing is for the all silver CHASER version of pin #88611. Walt Disney World 2012 Hidden Mickey Lanyard Series - Continent Stamps collection pin features a classic Mickey Mouse with Asia in a circle. Mickey is standing, looking forward with his hands stretched out. Beneath the land area is a silver Hidden Mickey icon. This Cast Lanyard pin features Mickey Mouse enjoying a horseback ride on a yellow horse with a white mane. Background is yellow. It is part of a five-pin collection highlighting various recreational opportunities at the Walt Disney World® Resort. This pin has a back stamp that says "2 of 5". This pin is part of the Cast Lanyard Collection/Series 4 at the Walt Disney World® Resort. There is a small hidden Mickey head in the lower right portion of the pin. Sorcerer Mickey carries a vial of pixie dust in his blue hat in this open edition pin. This is an Epcot Circle of Flags pin with Mickey standing off to the side. There are several versions of this pin: on the back of one is the 2000 logo on the back of the others is blank. Open edition pins have various dates on the backstamp. The 2007 version has the Official Pin Trading 2007 & © Disney China. The pin shows the flags of the pavilions at the World Showcase in Epcot: Canada, United Kingdom, France, Morocco, Japan, United States (or technically The American Adventure), Italy, Germany, China, Norway, and Mexico. This pin has Mickey Mouse floating in a hot air balloon type contraption, only instead of one hot air balloon, it's many different colored Mickey balloons. The banner underneath is purple with gold lettering which says "Walt Disney Travel Co. Inc."
This is part of the Booster Set #50458. It features Mickey with his eyes closed laughing about something on a red background. Pins in this set include: #50459, #50460, #50461, #50462. Mickey's face is above a red sign that says "Walt Disney World" -- his hands are holding it under his chin and you can see his feet. This is the Happy Mickey (pink square) pin only from set #75876. Oh Mickey! is a new series of merchandise featuring classic, pie-eyed Mickey Mouse. Add these pins to your Disney pin collection or trade them with fellow Guests or with Disney Cast Members wearing official Disney Pin Trading accessories. This open edition pin collection contains four Mickey Mouse pins. This pin is Mickey Pin Trading. 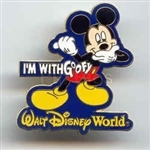 It is from the WDW Pin Trading Starter Set PP#3998. Released at the Disneyland Resort it features Mickey's white gloves joined at the thumbs and the fingers to form the shape of a red heart in the center. Mickey Mouse is featured on this dated 2007 pin - Mickey's head and face are shown with the numbers "07" in yellow and red, respectively. Minnie facing Mickey Mouse with a birthday cake between them on a table. A bunch of colorful balloons is overhead and they are standing on a red banner that reads "Happy Birthday." Mickey in a red bathing suit/swim trunks and red shoes is playing in water and splashing around. New version of pin. Mickey head inside a circle of flags representing the countries of World Showcase. EPCOT is written under Mickey's head in the blue area. This listing is for the all silver CHASER version of pin #94923. Disneyland Resort 2013 Hidden Mickey Cast Lanyard Series - Character Popcorn Labels collection pin features a classic Mickey Mouse standing in a striped box of popcorn. Mickey is wearing shorts and an apron. Mickey is holding a box of popcorn and a popcorn scoop. A silver Hidden Mickey icon is on the left side of the pin. This pin is part of the 2013 Disneyland Resort Hidden Mickey Series. The pin shows a classic style Mickey (from Plane Crazy) with his arms spread, in a filmstrip with a red background. The pin says 75 Years With Mickey on the lower left hand corner. It is stamped on the back: Official Pin Trading 2003, Disney Made In China. On this pin, Mickey and Minnie Mouse are here to commemorate the Happiest Celebration On Earth, a yearlong party at Disney Theme Parks around the world. They are standing behind a green and blue globe of the world. Each has one hand on the globe. They are dressed in their finest attire. Mickey wears a black tuxedo jacket and white bow tie. Minnie wears white with a white bow on her head. The background is light blue with small golden starbursts. The pin's thin border is red. Blue banner towards the bottom reads "Happiest Celebration on Earth Disney Parks and Resorts." Be a part of the biggest celebration in Disney history commemorating 50 years of magic at Disney destinations with new attractions and entertainment in honor of the 50th anniversary of Disneyland® Resort. Now you can join in the celebration with an exclusive five pin collection from Disney Parks and Energizer®. These five pins feature some of the new attractions and entertainment found at the Disneyland® Resort and at the Walt Disney World® Resort. Small Mickey head. This pin is the companion pin to pin #581. 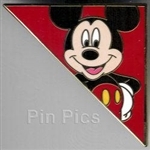 This listing is for one Mickey Mouse pin from set 59948. Mickey is sitting with his hands under his chin and elbows on leg. Red and blue circles and the letter "M" on the left side of the pin. Mickey Mouse pulls a Walt Disney Travel Co. banner behind his airplane, Earforce One, while the black travel company jet bears down on him. Outline of pin is puffy-cloud-shaped. Mickey is wearing red scarf and goggles. The cockpit window and base metal color is gold. This listing is for the all silver CHASER version of pin #82380. Walt Disney World 2011 Hidden Mickey Lanyard Series - Retro Classic "D" Collection features Mickey. Mickey is inside a letter "D" with the number "40". He is wearing his shorts and has his glove hand pointing up. Small Hidden Mickey head icon located at the left of the pin. This Mickey Mouse international collection pin features classic Mickey with his name in German, "Micky Maus", on a red banner below. Mickey is turned to the right and has his hand stretched in the air. He is wearing his red shorts with white buttons and yellow shoes. A silver Hidden Mickey icon is located on Mickey's foot. This pin is part of the 2011 Disneyland Resort Hidden Mickey Series. This Mickey Mouse international collection pin features classic Mickey with his name in Norwegian, "Mikke Mus", on a red banner below. Mickey is turned to the right and has his hand stretched in the air. He is wearing his red shorts with white buttons and yellow shoes. A silver Hidden Mickey icon is located on Mickey's foot. This is the red cloisonne Pin Trading pin PTP from Tokyo Disneyland. This pin features the familiar Mickey Mouse with his left hand extended in the center of the pin. The red border has the words "PIN TRADING...Tokyo Disneyland". There's also a yellow banner through the center of the pin with drawings of the rest of the Fab5 -- Pluto, Donald, Minnie and Goofy. This is a cutie little Mickey Mouse face pin that has no mouth. It measures 3/4" and is gray metal and hard enamel. This open edition pin features Mickey Mouse riding the new Test Track Car at Epcot. The car is blue and you can see the Test Track building in the background. This is one of five open edition pins released for Mission: SPACE. Each pin features one of the FAB 5 wearing Astronaut gear. Mickey is featured here with red trim on his suit. Part of mystery pin series # 88507. Sealed Mystery 5 Pin Tin Set at 2007 April with some of your favorite Disney Characters. Each tin comes with five randomly selected pins featuring characters in action. This Mickey Mouse international series pin features classic Mickey with his name in English, "Mickey Mouse", on a red banner below. Mickey is turned to the right and has his hand stretched in the air. He is wearing his red shorts with white buttons and yellow shoes. A silver Hidden Mickey icon is located on Mickey's foot. From set #36781. Mickey Mouse celebrating Halloween. He is dressed as a skeleton. His mask is yellow and he is holding it off of his face. Has the pin trading 2005 or 2006 logo on back. Open the silver gates of this open edition pin to see Mickey Mouse welcoming you into the Magic Kingdom® Park at Walt Disney World ® Resort. This pin features Mickey with balloons in front of Cinderella Castle. Remember your visit to the Walt Disney World® Resort, the place Where Dreams Come True, with this Open Edition pin. Mickey Mouse and Minnie Mouse are pictured wearing new celebratory attire, while the Walt Disney World® Resort logo is a pin-on-pin. This listing is for the Mickey and Minnie Mouse pin from the open edition "Disney Couples" Mystery Collection (#95855). This pin features pie-eyed Mickey and Minnie Mouse. Mickey is holding yellow flowers for Minnie. Behind them is red and pink hearts. A round pin with Mickey riding in a red car against a yellow background. A blue banner that reads "Ride & Show Engineering" is centered on the pin. "Walt Disney World" is written below that in black. All silver/pewter; Mickey's hand is holding a child's hand; ball background like Spaceship Earth EPCOT symbol. This pin was distributed on a small card to WDW cast only and is signed by WDW president Al Weiss. Text on the card reads, "Greetings, I'd like to thank you in advance for making the Walt Disney World Celebration an event where the entire world can Celebrate the Future Hand in Hand. We present you with this pin..." Distributed in 1999. Top of pin design says "Sixty Years", middle reads "Mickey" and bottom says "With You". In the center of the design Mickey is wearing a gray tuxedo. Pin size is 1 3/8" x 1", back reads "@Disney, Made in Taiwan". Sold in 1988 WDW had large signs on the light posts with this same image on them. A new line of Annual Passholder 2002 logo products are being introduced. This pin has Mickey Mouse dressed for a safari holding a pair of binoculars. It came on the WDW 2000 logo card. This pin is still available with "Official Pin Trading 2004" logo on back. It has also been seen by several members with 2007. Jewel pin for the Celebration of 40 Years of Magic at Walt Disney World. Mickey is stood with his legs crossed and leaning on the right hand end of the "D" which contains the 40 of the logo. The 0 of the logo is a globe with Mickey ears. A red banner with white writing go across the centre of the pin. this says "40 Years of Magic, Walt Disney World"
Reach for the sky - a new Sheriff is in town! This Open Edition pin features Sheriff Mickey Mouse. The pin has been sculpted in a metal relief to give it a 3-D appearance. This Mickey Mouse in Inner Tube pin is part of the new Hidden Mickey Collection. This new version looks very similar to the original, except there is a Hidden Mickey on the front. The back has the 2006/2007 Official Pin Trading logo and is marked Hidden Mickey Pin-1 of 5. Original Pin is #13518. Celebrate the global spirit of athleticism with the Summer of Champions pin collection. This Open Edition pin features Mickey participating in different sports including cycling, swimming, running, fencing, and soccer. The other side of the spinner contains the "Summer of Champions" logo. The gold Mickey on the front is three-dimensional, and the figures of Mickey are raised off the gold background. The pin measures 1 3/4" wide and 1 1/2" tall. The backstamp includes the words "Summer of Champions" which is different from the logo on the back of the spinner. This is a version of the pewter postage stamp pin featuring Mickey Mouse as Steamboat Willie. Mickey is standing at a ship's wheel, with arms out straight. "EuroDisney" is written along the left side of the pin. This pin was given to VIP members of the Disney Movie Club. There will be a series of the pins. The pin it self came in a small box, with the space to hold two more pins. The next two pins will be Donald and Minnie. According to the letter a new pin will be relesed every 4 to 6 months. The pin also came with a certificate of Authenticity. The pin is a yellow box with Disney Movie Club in red. Above the box is Mickey from the elbows up. The Disney Movie Club is a DVD movie club from Disney. They have a web site disneymovieclub.com. It is like other movie clubs, but they only offer Disney movies. This pin is one in a series of five issued to commemorate the opening of Euro Disney in 1992 (Disneyland Paris). It has the words "Kodak. Official Sponsor. Euro Disney Resort. © Disney" on the back of the pin. The pin was a premium given when purchasing either a Kodak roll of film or a Kodak Camera during the opening year of the Euro-Disney Theme Park in France. The pin comes in it's own match pack type container. The reverse of the pin reads: "Kodak Official Sponsor Euro Disney Resort, Disney." This pin was found at WDW on a CM lanyard. It is a green square with Mickey Mouse holding a pencil bent into the "ears" shape at the eraser end. Looks like the key to the kingdom. Pin reads "Disney Y.E.S. - Youth Education Series" and "Your Walt Disney World" is at the bottom. This Open Edition pin features a scarecrow shaped like Mickey Mouse at Candy Corn Acres. Candy Corn Acres is a holiday overlay that can be found at Disney's California Adventure™ (DCA). 2008 Year of the Mouse. Upper left has a red Mickey icon with Mickey Mouse himself inside it. Mickey is dressed in a samurai suit. The square part of the pin has "2008 YEAR OF THE MOUSE" on a purple background with a lavender border. The Park's logo is along the bottom. This listing is for the Mickey Face pin from the open edition Hipster Themed D-Tour Mini Pin Set (#99402). This pin is part of the 12 Months of Magic pin collection sold in USA Disney Stores. It has Mickey Mouse, dressed as a pilgrim, in the crow's nest of the Mayflower. A seagull is standing in back of him pointing to the right. Available only to Cast Members, it shows Mickey, facing slightly left, holding a black banner or sign in his hands with "COMPANY D" in gold. This open edition pin released at Walt Disney World Resorts features Mickey Mouse as a Movie Director holding a megaphone and wearing a hat. He is pointing to a clapboard that reads Disney's Hollywood Studios (formerly Disney's MGM Studios) that has gold stars around it. This pin has slight movement. The top of the clapboard and mickey's hand move, to close the clapboard. This gold-finished, sand textured-back pin measures 1 3/4" tall by 1 5/8" wide. It is backstamped with the 2008 pin trading logo and, "(C)DISNEY-CHINA". Celebrate the Year of a Million Dreams with the Disney Travel Co. and Mickey Mouse in this pin, created exclusively for the Disney Travel Company and Disneyland Resort. Guests can receive a Mickey and Friends Puzzle Pin for $1.00 with any purchase of $30.00 or more. * The pins are in a small sealed black plastic bag. Which pin the guest receives is unknown until after purchase. This square shaped pin features Mickey Mouse. The back of pin has MM Gang 1 of 5 printed on the back. Official Pin Trading 2008 logo is also printed on the back. Edge of pin is rainbow colors of green, orange, red and blue. Celebrate the global spirit of athleticism with the Summer of Champions pin collection. This Open Edition pin features the logo for the Summer of Champions. the pin features Mickey against a background of the Olympic flame. Mickey is dressed as a member of the American Olympic team. The border of the pin is a band of red between two smaller bands of blue. There are white stars on the red. The year 2008 is in gold at the bottom of the pin. The pin measures 1 1/2" wide and 1 1/2" tall. The backstamp contains the 2008 ODPT logo, the words "Summer of Champions", and the Disney copyright. This pin came with the "Spaceship Earth Memory Box" as seen in Disney's Flex Feature 2000 catalog page 8 #3. I had no idea it came with pins until I got it. Inside the box was a Lanyard (black) with card holder (but cardless) and 2 pins attached to it. This one and #719. The box was sealed so I assume that there is a lanyard & 2 pins in every memory box. Pins on these lanyards were as follows: 1- Gray Flex Package Pin and 2 Disney Store 101 pins. Several different 101 pins were available depending on when you bought the Spaceship Earth. Pin has Mickey in the green zero and the 4 park icons in the background, Magic Kingdom Castle, Epcot Spaceship Earth, MGM Earful Tower and Animal Kingdom Tree of Life. Minnie Mouse is inside the black "0", wearing her traditional red dress and hairbow with white polkadots. The "8" is red with the yellow buttons from Mickey's shorts - Mickey is peeking out from the top of the "8" with his left hand stretched out. 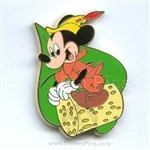 Part of Pin Set 56435, this is for the 1947 Mickey & Goofy (Fun and Fancy Free, Mickey and the Beanstalk) pin only. Mickey Mouse is riding an Autopia Car. Pin features Mickey and Minnie. Mickey is holding his hand up and Minnie (wearing a pink bow) is holding her clasped hands under her cheek. Pin has rectangular light blue background with gold and white stars and reads Disneyland Resort across the bottom. Disneyland Resort 2014 Hidden Mickey Cast Lanyard Series - Character Tiki Faces collection pin features a tiki mask of Mickey Mouse. A silver Hidden Mickey icon is in the corner. This is the Disney Cruise Line 2002 Logo Pin. It is only available for purchase on the Disney Magic and Disney Wonder. This pin shows Mickey Mouse kneeling in the sand. He is wearing a tropical shirt that has a Hidden Mickey on it. He is wearing sandals. The year 2002, the words Disney Cruise Line, and the DCL logo appear to the left of Mickey. This rectangular pin features Mickey in astronaut gear. We are not sure which planet he is on but there is a white rocket on his left hand side and a flag has been planted. The flag is white with an orange and white mickey head on it. The words EXPLORE (with the O as a planet in orange) the GALAXY are on the pin. The pin is done in red, white and blue, with Mickey on a motorcycle and a look of determination on has face. The word Mickey to the Rescue are on the pin. I guess we have to try and guess what or who he is going to rescue. Mickey is shown here in one of his classic poses. The difference is that this pin is done in black & white. At the top of the pin is the word MICKEY with AMERICAN beneath and SINCE 1928 in the middle of the pin and at the bottom CLASSIC MOUSE. Mickey as the Sorcerer's Apprentice is in front of Spaceship Earth. Mickey is ready for the soccer field. Can you identify all of the flags which cover him? He has that high kick with the soccer ball ready to go. This pin sits at an angle, the posts (2) do NOT have the safety nubs and there are three backstamps, the top is located between the posts and is the trading stamp, the middle stamp is the NEW DVC logo, and the lower stamp is 4 lines of text (very small - will need to obtain a magnifier to read it). The whole back is covered with the mickey icon impression. Mickey is wearing a brown pirate hat and his ears are visible above it. The anchor is white and blue and is separated from the round portion of the pin. The Disney Vacation Club is written on the blue band below Mickey's face. Mickey has a blue patch over his left eye and his right eye is looking upwards. He is also wearing a red bandana with a knot to his left side. The background behind Mickey is a pale green. This pin was given to DVC members while sailing on the Fantasy Maiden voyage. Unsure if it was given out prior to that sailing. Mickey Mouse and friends have planted a beautiful garden pin collection. This pin features Mickey Mouse on a seed packet for Carrots. This pin features classic silhouette pose Mickey Mouse standing and features metallic color fills with peace signs. Peace signs make up his yellow shoes, red shorts with yellow buttons, peach face, black ears and body, and pink tongue. Another Disney on Ice, given as a gift at LAWSON, which is a convenience store in Japan. Mickey Mouse is in a tuxedo and Minnie in a pink ballgown skating. "Walt Disney's 100 Years of Magic" written in yellow/gold on a blue banner. This pin pursuit pin released at WDW features Mickey dressed in a toga holding a scroll and standing on a column. The bottom of the pin reads I conquered the world. Guests will be able to declare "I Conquered the World" when you've completed this fun and exciting pin pursuit! For the first time ever, you will be able to pick up your free pin pursuit map at locations throughout Walt Disney World to start the quest. Then your journey will have you traveling the entire World to answer a trivia question or trade a pin with a Cast Member at 7 different locations to get a free stamp! Once you have gathered all the stamps, you will complete your adventure at Disney's Pin Traders in the Downtown Disney Marketplace to receive your just reward, a free Build A Pin base pin that fits directly on their completed map! Open edition Headphones Mickey Mouse pin. This pin features a print screen element. Open edition Skateboard Mickey pin. This pin features a print screen element. The pin is modeled after a famous Norman Rockwell painting entitled "Triple Self-portrait." The pin shows Mickey looking into a mirror and supposedly painting a picture of himself. Instead the painting is a picture of Walt Disney on an easel. Mickey is sitting on a wooden bar-type stool and has his foot on a wooden crate that has the end painted green. There is a mustard yellow waste can (garbage can, or trash can). The mirror that Mickey is looking into is set on a stack of cases (maybe artist cases). One case is green in color, and the other one is blue. On the artist easel is the large sketch of Walt, signed by Mickey Mouse. There are also three small sketches that are tacked to the edge of the sketch of Walt. They appear to be a Mickey Icon, a Christmas-type tree, and a third sketch that is unrecognizable. On the top of the post of the easel is a black Mickey Mouse ear hat. This listing is for the Mickey Mouse pin from the open edition Walt Disney World Circle Icon "D" mystery collection (#88448). This pin features Mickey Mouse in a red circle with the iconic D at the bottom. Mickey is wearing a blue shirt and pin lanyard. Mickey has stepped off the train and is looking back at the engine. He has luggage in his hands. At the top it reads RIDE THE RAILS and their is a red & blue logo at the bottom which reads Walt Disney World Railroad. Open Edition Pin is the logo for the Mouseketeers Club. Mickey has a worried expression on his face as he looks over his left shoulder. The speech bubble above him says "OH, NO! I FORGOT!" This pin has a light green background. Mickey is smiling with his hands in the air. His speech bubble says "OH, BOY! WHAT A SWELL IDEA!" This pin has a light blue background. Mickey Mouse is wearing a dark blue top with a green collar and smiling. There is a black border/frame and red backround. Open edition I’ll be your Mickey pin. These pins feature print screen elements. This listing is for the Wink Wink pin found inside the Mickey Expressions mystery box. Each box contains two mystery Mickey Expressions pins. The Wink Wink Pin has Mickey winking his right eye. Mickey is dressed in white pants, a red shirt and red hat. Both arms are raised in the air and he is pointing #1. At his feet are a baseball and bat, basketball and soccer ball. Open edition Stars and Stripes Mickey Mouse pin. This pin features a print screen element. This is the Mickey Mouse pin from the Limited Release PWP Train Conductor Collection pin series. This pin features railroad engineer Mickey Mouse riding atop a train engine in blue overalls and matching cap with a white shirt and red neckerchief. Open edition Boho Standing Mickey pin. This pin features a screen print element. WDW - Mickey Expressions Mystery Box - What? This pin features Mickey Mouse dressed as Santa holding a gift on top of a glitter red background of stars shaped as an ornament. It has a red ribbon tied to the top and says "The Holidays are Swell" and the back is Mickey head textured. Disney Trading Pin 102000: WDW - Mickey Expressions Mystery Box - What? This listing is for the Snooze pin found inside the Mickey Expressions mystery box. Each box contains two mystery Mickey Expressions pins. The Snooze pin has Mickey with his eyes closed and his mouth open as if he is snoring. A donut shaped pin decorated as Sorcerer Mickey. The tp of the pin is iced in blue with white stars and crescent moons, The bottom is red representing his robe. There are a total of 15 pins in this set. Mickey is ready to spring into action as a University of Alabama Crimson Tide in this Open Edition pin. Mickey is wearing a red maroon/white football uniform on the green field. A maroon "A" is on the right side of the pin. This listing is for the Too Cool pin found inside the Mickey Expressions mystery box. Each box contains two mystery Mickey Expressions pins. The Too Cool pin has Mickey with a smirk on his face and cool shades. This limited edition pin released through WDW Travel when you purchased a vacation package. It features Minnie and Mickey in the back of a Bus that has the letters wDw on it. In this comic pin, Mickey is looking to his right with a worried expression. In a bubble above him, it says "AW GEE, AM I MISSING THE GAME?" Minnie is not amused and is looking at him with an angry expression with her hands on her hips. This is #51 of the 100 Years of Dreams pin series from the Disney Store. This pin came with the WDCC membership kit of 2000. It has the free gift sculpture, "Millennium Mickey On Top of the World", on the top and the Walt Disney Collectors Society Logo on a green background on the bottom. This limited edition Annual Passholder pin released at the Animal Kingdom of WDW celebrates 75 Years with Mickey. Mickey Mouse is dressed in a safari outfit standing in a filmstrip next to the Tree of Life. This is #59 of the 100 Years of Dreams pin series from the Disney Store. This listing is for the Sorcerer Mickey pin ONLY from the 2015 Dated Booster Set (#107568). Sorcerer Mickey's head / face is featured next to yellow 2015 numbers with stars on them. Mickey is wearing Yensid's blue hat with white stars and a moon. Fourth in a series marking Walt Disney's 100th birthday. Each pin shows a milestone in his career. This one pictures a 1929 car that was used to promote Mickey Mouse cartoons. The pin has an error; "vehicle" is spelled as "vechicle" on the pin. Each pin in this series is individually-numbered on the reverse. This Open Edition pin features a classic logo for the Happiest Celebration On Earth. Mickey Mouse, a pin-on-pin, is seen standing in front of a stylized golden castle. White background reads "Fifty Years". Red banner in front of Mickey reads "Disney Theme Parks." Under Mickey's feet is "Walt Disney World." Released for the 50th Anniversary. Mickey Mouse is ready to spring into action as a University of Texas Longhorn in this Open Edition pin. Mickey is wearing a football uniform. Size is approximately 1 3/4 inches tall and 1 1/2 inches wide. This pin is the old style pie eyed Mickey Mouse on a blue background. Pin measures 1 1/8" (28 mm) wide by 1 1/4" (32 mm) tall. This pin shows Mickey from the waist up wearing a red and black striped rugby shirt. The pin from the Disney Channel 10th Anniversary boxed pin set is an epoxy domed pin. There is a very similar pin which is a true cloisonne pin (Pin 27432). One easy way to tell the difference is that the back of the epoxy domed DC pin has a 4-line back stamp saying: "THE DISNEY CHANNEL, 1983-1993, ©DISNEY, MADE IN CHINA," while the back of the cloisonne version has a 2-line back stamp reading: "©DISNEY, MADE IN TAIWAN." This pin features Mickey Mouse wearing a blue tank top, yellow shorts and blue/yellow running shoes running through a red ribbon at a finish line. Mickey's is written in blue, All American Pin Festival is written in white, and Summer Games 2004 is written in red. The dimensions of the pin are 1-3/4" H x 2-3/4" W. This is the larger-sized open stock version of #31557. Part of set # 108283. Chubby Face with Rosy cheeks, full body. Mickey is wearing red and yellow pants. This listing is for Mickey Mouse pin ONLY from the Disney Tsum Tsum Pin Collection #108000. This pin features Mickey Mouse in his simple Tsum Tsum form. His head / face is shown in a cutie / cute style. Below his head is a little glimpse of his cute feet. Mickey Mouse portrays Indiana Jones in this Open Edition pin. Mickey is featured as a pin on pin. Mickey, dressed as Indy with a brown fedora hat, is running from the rolling boulder from the Indiana Jones Adventure attraction - the boulder is a spinner made of free-d material. This pin is very similar to pin 52441. Here the background looks like a treasure map where in the older pin the background was a cave. This pin features Mickey waving in a blue square saying "Hi Ya Pal!" It is part of the Comic Strip Booster Pack #111867 featuring characters in comic style squares. This is of Mickey swinging a golf club. He is dressed in a regular duffers outfit in orange. Mickey, in a Vaudeville type outfit, tips his yellow and red hat with his left hand. Mickey wears a yellow hat, red bow tie, green jacket and blue pants. He is facing forward, his right foot extended forward as if he is taking a step. This open stock rack pin released on the Disney Cruise Lines (DCL) features Mickey Mouse in a Captain's hat saluting. White gloves, red double breasted jacket and blue trousers with a red stripe down the leg. 1" high. This is part of the Cast Lanyard Series #3. The pin depicts Mickey Mouse dressed as an astronaut in a greyish blue and maroon space suit holding his space helmet in his right hand. He is ascending a set of 3 grey steps on his way to a square space portal as he waves goodbye to us with his left hand. Has "2005" on the back. This is one from the series of Theme Park Mickeys. This one is Mickey at Epcot. DLR's 2015 Hidden Mickey Wave B - Mardi Gras - Mickey. This Cast Member pin from WDW was given to out at a Merchandise event in late 2000. The event was previewing the upcoming 2001 merchandise. As of Oct. 2001 being given to any Merchandise Cast Member who has three (3) perfect evaluations in a row. Mickey Mouse stands in the center of this round pin with a purple and blue border. This open stock pin on pin from Walt Disney World features Sorcerer Mickey in his red robe and blue hat holding "2004" in his hands against a blue background with " Walt Disney World" at the base of the pin. Has fireworks going off behind the 2004. 12 Months of Magic. Mickey Mouse, dressed in his red bandleader outfit, is conducting in this short. It is a round pin with sheets of music, leaves and various other debris swirling around him due to the tornado in the film. This is the pin given to Cast members who worked on Thanksgiving day 2002 in Disneyland. It shows Mickey and Minnie dressed as pilgrims and reads Thanksgiving 2002. This pin celebrates Company D's 10th Anniversary. It is Mickey running through the 0 of the 10th and below him reads Walt Disney World Resorts Company D with Year below that. Square white artsy sketch of Donald, Mickey, and Goofy. Under them are the words Cast Member in blue which is reflecting the words Cast Member in light blue, except for the letters "WE" which are yellow. This pin features Mickey is pushing through a mirror. This image is from the Mickey short "Through the Mirror" The pin appears to be done all in reverse. The top of the pin reads Backstage Magic or cigaM egatskcaB (with a mirror finish to it). Mickey and the candlesticks are pin on pin (3D). This pin is given to guests who participate in the 7 hour Backstage Magic Tour at Walt Disney World. Travel backstage into the Magic Kingdom to see the utilidors, examine backstage computer controlled attractions at Epcot, see behind the scenes at the Living Seas, have a special lunch at the Disney-MGM Studios, plus other surprises. The cost is $199 per person, and Theme park admission is not required. This silver-finished, textured-back pin measures 1 3/8" tall by 1 1/2" wide. It is backstamped with the (various years) pin trading logo and, "(C)DISNEY-CHINA". Note: The candlesticks come off very easy. They are just glued on. This is actually Mickey Mouse as he appears in "Mickey and the Beanstalk", a segment of FUN AND FANCY FREE. Mickey is wearing a green hat, green tights, a red shirt and yellow shoes. He looks ready to take on the world. Back reads: © Disney - sedesma S.A. This pin is from Spain. This is the Mickey Waving (blue square) pin only from set #75876. Oh Mickey! is a new series of merchandise featuring classic, pie-eyed Mickey Mouse. This 2 inch by 1.5 inch double-backed pin is offered to guests taking part in the Epcot Candlelight Processional Dinner Packages. The pin features Sorcerer Mickey waving his wand over Spaceship Earth, changing the 2000 to a 2001. The Epcot Christmas Tree and World Showcase are also featured, and the pin is framed in blue and holly. This pin's design is very similar to the paper sculpture poster, "Mickey's Millennium Moment", by Costa Alavezos which is being sold at WDW. This is the only time that a pin was part of the Candlelight Processional Dinner Package. This pin was also in every grab bag sold at the first Epcot Pin Celebration. This pin is one in a series of Walt Disney World exclusive pins made for Cast Member to wear on their lanyards for trading with the public. The back of each pin reads Disney's Lanyard Pin Series. It features Mickey Mouse in the center of one lens of a pair of red sunglasses (the other half is #15328). He is wearing a pair of green and yellow sunglasses himself that match his collar. 2015 Wave B Hidden Mickey for the Walt Disney World Resort. This is the Spacesuit Mickey Mouse. Hidden Mickey Pins are 112154, 112155, 112156, 112157, 112158. Chaser is 112146.
his is a part of a series of 5 Mickey Mouse lanyard series III pins which shows Mickey dancing with a straw hat in his right hand over his head and a cane is in his left hand. He is dressed like a member of the Dapper Dan's. There is a small red Mickey head on his shoe. He represents the Magic Kingdom. Celebrate a special anniversary or birthday with this Open Edition pin featuring Tinker Bell and Mickey Mouse. It has Mickey With his hands out and the saying "Celebrating _ Years". There is a spinner behind the _ and the years are: 10, 15, 18, 20, 21, 25, 30, 35, 40, 45. There are stars flying and Mickey is jumping for joy. Tink is flying along the bottom, leaving a trail of pixie dust. Mickey Mouse is in a Graduation Cap and Stars and Stripes Gown. He holds a diploma above his head in one hand. The pin reads Graduation 2003. This pin is released at Walt Disney World Resorts commemorates Mickey's 75th Birthday. It features Mickey as the Sorcerer's Apprentice. The pin reads on the bottom, 75 Years With Mickey. It is stamped on the back, Disney Pin Trading 2003. This pin, along with five others, are apparantly available to resort guests. You receive a certificate from your resort to redeem for the pin. Pin measures 1 & 1/8 inches by 1 inch in size. From set 41886. Mickey is his cutie self standing in front of yellow circle next to a white flower and a butterfly with pink wings. He's about 3/4" tall.